An independent travel guide to Phnom Penh with candid reviews and recommendations. No sponsored content, no advertorial. 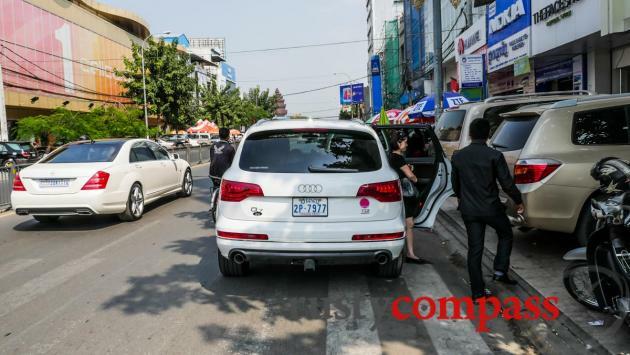 Luxury cars abound in one of Asia's poorest cities. Independence Monument -Suddenly Phnom Penh has traffic jams. 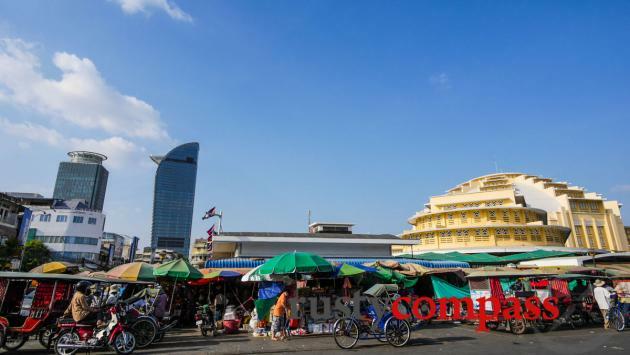 Phnom Penh's central market and an emerging modern skyline. Tuol Sleng - school turned Khmer Rouge concentration camp. In April 2015, Phnom Penh marked 40 years since the city was captured and then evacuated by Pol Pot's murderous Khmer Rouge regime. After more than three decades of gradual recovery, Phnom Penh's makeover is on in earnest. Streets are buzzing, cranes are hard at work. A city almost entirely depopulated by Khmer Rouge decree in 1975 is a bulging centre of hope and opportunity again. Phnom Penh is emerging from the ashes. It couldn’t be expected to be an easy journey. And it isn’t. 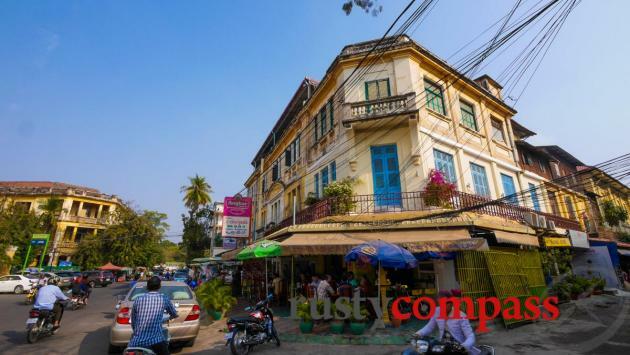 But this is one of Asia's most compelling cities with plenty of things to do, a wonderful mix of Khmer and French colonial architecture and a new atmosphere as bars, restaurants, galleries and boutiques open up, serving an emerging middle class and curious visitors. And Phnom Penh still sports two other especially enticing ingredients - a profound story and a sense of exotica. There are plenty of reality checks. This is after all the capital of one of Asia's poorest countries. Beggars, touts and seediness are all part of the city's fabric. And the conspicuous wealth that cohabitates with the misery is disconcerting. You're more likely to see a Lexus, a Hummer or the latest model Merc in Phnom Penh than many developed cities. Tourism is also transforming Phnom Penh. And as more people choose to visit the city to experience its emerging coolness, it's gradually shifting its longstanding and hard to shake off reputation for sleaze. 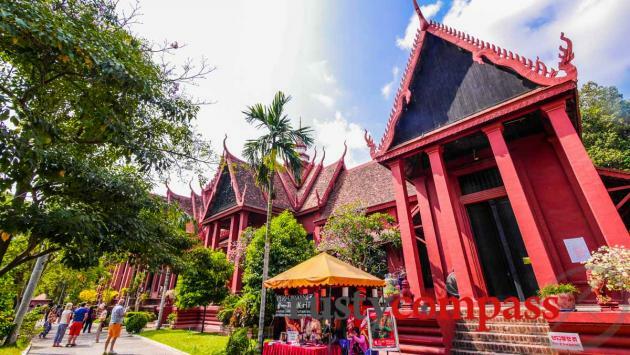 The Royal Palace is a great place to start a journey into the life of one of the twentieth century's most intriguing characters - Norodom Sihanouk. 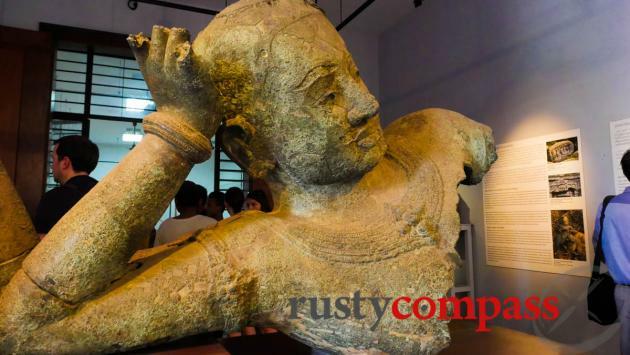 Nearby, the National Museum houses the world's finest collection of Angkorian sculpture in what is, despite its modesty, one of Asia’s most delightful museum complexes. 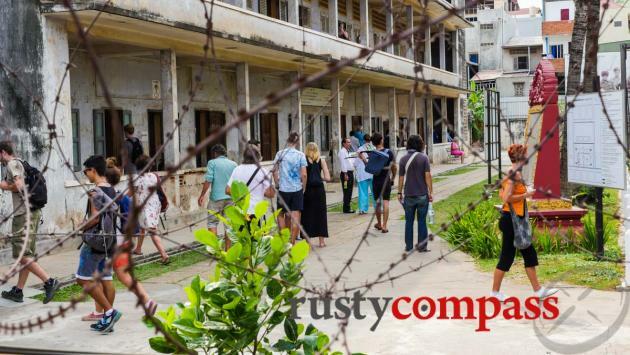 The genocide museum at Tuol Sleng is a harrowing experience not least because in addition to showcasing the horrors that took place in this school turned concentration camp, it tries to humanise both the victims and the perpetrators of the Khmer Rouge's barbaric project. But a visit to Phnom Penh is not all about solemnity. It's also about recovery and revival. Take time to walk the streets, visit some of city's beautiful wats and get to know the locals. Shopping eating and drinking are now a big part of the Phnom Penh experience. And this city is home to some of Asia's most tasteful, well priced and well loved boutique hotels and guest houses. 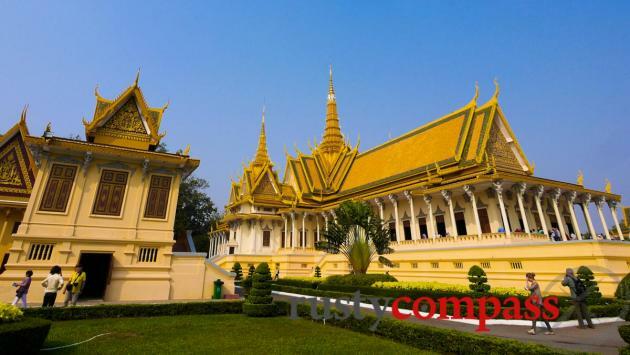 Don't overlook Phnom Penh during your visit to Cambodia. International flights from South East Asia's main hubs - Bangkok and Singapore and other centres - are frequent and inexpensive. Flights from nearby Saigon and Hanoi are also frequent but artificially high on account of the lack of competition. Phnom Penh’s Pochentong Airport is modern comfortable and a short ride from the city - depending on traffic. Domestic flights operate to a handful of major points. Taxis operate from the airport to the city centre and charge a fixed price of 8USD. 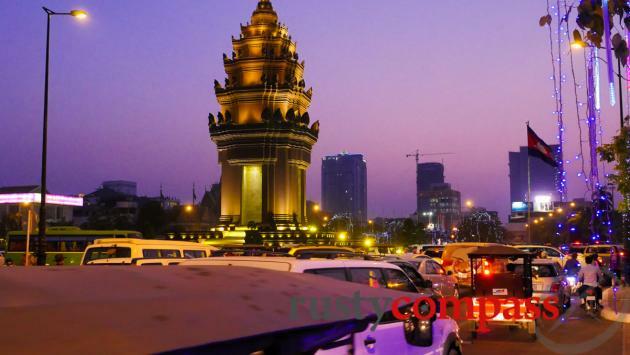 Travel to Phnom Penh by road from Ho Chi Minh City (Saigon) is increasingly popular. The roads are rapidly improving, it's cheap and at 6 - 7 hours, it only takes a couple of hours more than the flight by the time all of the airport variables are considered. There are reasonable quality bus operators on the route as well so it's a good option for many travellers. The only headache is the clumsy Immigration and Customs process - but this is improving too. The road journey from Bangkok is more arduous. It makes more sense to stop in Siem Reap along the way. 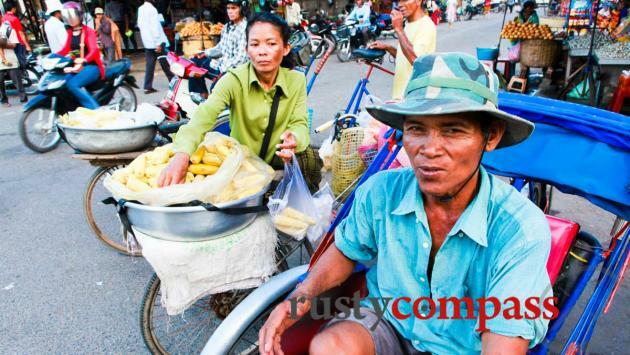 Road travel to domestic points - Siem Reap, Kep, Kampot and Battambang is easy and inexpensive. The Mekong River border crossing from Chau Doc in Vietnam opened almost a decade ago and is a good option for travellers wanting to explore Vietnam's Mekong Delta before heading to the Cambodian capital. The journey including formalities is around five hours. 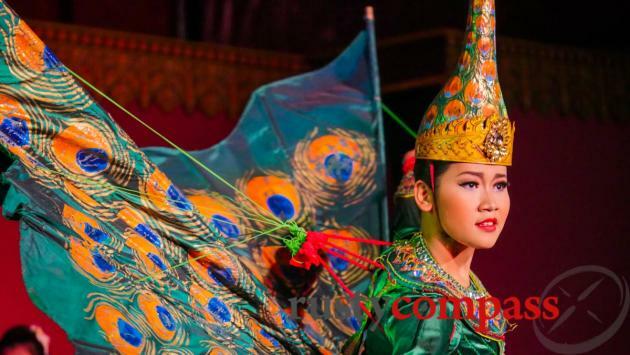 There are high-end cruise operators running the route between Vietnam and Cambodia on luxury liners as well. 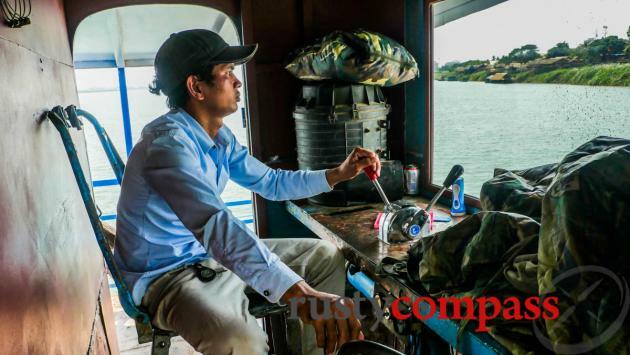 River travel between Phnom Penh and Siem Reap evokes a sense of romance that is quickly dispelled once you board the ferry. 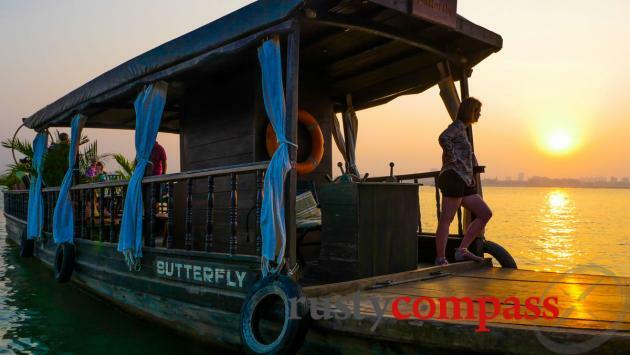 Unless you’re travelling on a longer luxury cruise from Vietnam, the main ferries operating the 5 - 6 hour journey are of mediocre quality, not terribly safe and have a history of unreliability. It’s also important to remember that the service is best in the wet season (June to November) and doesn’t operate during those months in the dry season when river clearance is insufficient. Tickets are available along Sisowath Quay. A train service has recently opened (2017) to Kampot and Kep that we’re looking forward to checking out. Private car or taxi travel can also be convenient flexible and good value for money when two or more people are travelling together. Arrangements for bus and car travel can usually be made at your hotel or at ubiquitous traveller booking agencies. Phnom Penh is an easy city to get around. 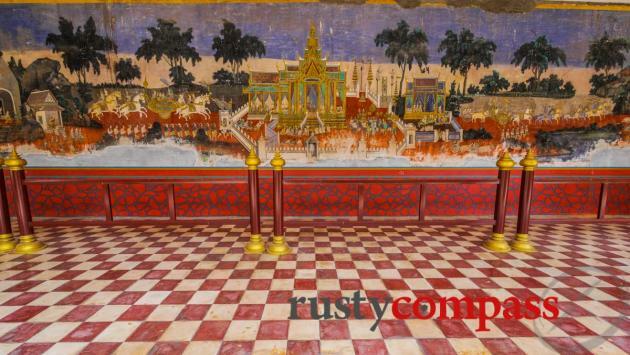 All of the sites of the city are in a compact area and comfortably accessed by bicycle or tuk tuk. The Killing Fields are 17 kilometres and are the only sight any distance from the downtown area. If you can cope with the heat, you can get plenty of sightseeing done on foot. And walking is a nice option. Pavements and roads are reasonably easy to negotiate. If you're in a hurry, tuk tuks are a good way to get around -though we sense a nastiness starting to appear with many of Phnom Penh’s tuk tuk drivers. 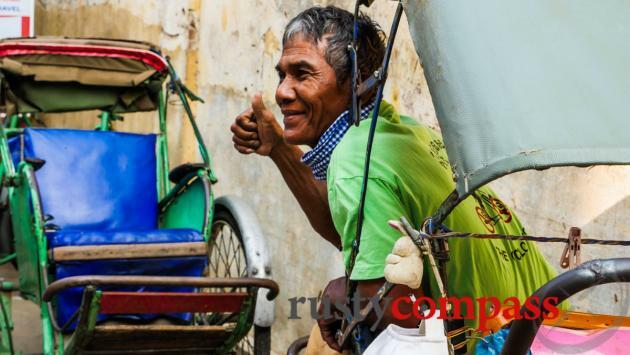 Many tuk tuk drivers speak good English, are friendly and reliable. Avoid those that hassle most aggressively. Tuk tuks are relatively expensive compared to taxis in other comparable regional cities. In 2017, new apps for managing tuk-tuk travel hit the market. These promise to make tuk-tuks safer and more accountable. If you really like your tuk tuk driver, book him again for the next day. It’s a win for you, for the tuk tuk driver and it encourages some longer term thinking by those hassling outside tourist sights. A little generosity with good tuk tuk drivers is good practice. Bicycles are available for hire and Phnom Penh's traffic is not normally too heavy - with some notable exceptions. Driving is a new sport here and the city's new breed of Lexus four wheel drive owners view cyclists as a low form of life. Be careful. A taxi service has recently been established as well. While relatively safe, Phnom Penh poses some health and crime challenges - perhaps to be expected in one of Asia’s poorest large cities. Common sense precautions will normally be adequate for a safe and enjoyable visit. As it’s by far the biggest city in Cambodia, Phnom Penh accounts for an inordinate amount of the country’s crime against travellers. Opportunistic theft such as bag snatching, camera snatching and pick pocketing are an increasing problem and it pays to be take steps to minimise your risk of becoming a victim. Thieves tend to travel by motorcycle and work in pairs. Travellers can reduce risk by dressing modestly, carrying only essential items and by avoiding leaving bags and cameras accessible when crossing streets and riding motorbikes. Drive-by snatchings can be especially dangerous if victims are dragged to the ground. Violent crime is rare in Phnom Penh however there have been numerous reports of incidents in bars and clubs between young Khmer men - often armed and with bodyguards - and western males. Avoid confrontation in these settings. A number of robberies have also involved weapons. There have also been reports of other assaults, including sexual assaults in areas frequented by travellers. All travellers, especially women, should exercise the same caution as you would at home and avoid walking alone in dark, unfamiliar, quiet areas at night. Some travellers see the wide availability of illicit drugs in Cambodia as an opportunity for experimentation. Penalties for illicit drug use are severe. A number of young travellers have died in Phnom Penh and other Cambodian cities in recent years as a result of such experimentation. Stay away from drugs. Scams seem less common in Phnom Penh than in neighbouring Vietnam - especially sophisticated scams. Your biggest risk is probably a dodgy tuk tuk driver. There have been reports of scams concerning offers to take travellers to “orphanages” of dubious authenticity. Be wary of people making strange offers anywhere. When travelling by tuk tuk, be sure to agree your price in advance. Phnom Penh’s roads pose a safety risk to travellers - especially travellers deciding to ride a motorcycle for the first time. Erratic driving and speeding are common hazards. Travellers should also be wary of electrical fittings in hotels and elsewhere and road and construction works. Most Phnom Penh restaurants observe higher standards of hygiene than other parts of the country - but quite a few travellers still come unstuck here. Only drink bottled water - and lots of it. The body needs lots of fluid in this climate. There may even be a case for using bottled water for brushing teeth. Sticking to cooked foods will further reduce exposure to food borne bugs. That’s a little tough though as salads are definitely a tasty part of the cuisine. We’d also suggest avoiding empty restaurants. Local restaurants with plenty of local patrons may look less hygienic but they’ll usually be a better bet than the empty pristine tourist places. Sexually transmitted diseases including AIDS, Hepatitis and other illnesses are prevalent in Phnom Penh. Phnom Penh has Cambodia’s best medical facilities but these are still well behind Western and regional standards. Where there is a choice, any ailment or illness requiring hospitalisation is best treated outside the country in neighbouring Bangkok or Singapore. Travellers will frequently be required to pay for services in cash even when holding comprehensive travel insurance. Full documentation will then be required in order to make an insurance claim. In this instance, ensure that your travel insurer is contacted as soon as possible and consulted on best options. +855 23 991863 (out of office hours +855 12 891613). Mix of foreign and local doctors and has a 24hr emergency service. A popular choice for foreigners living in Phnom Penh. More serious medical emergencies usually require evacuation to Bangkok or Singapore. Travellers should ensure that insurance coverage includes hospitalisation and evacuation costs. US dollars are very widely used and frequently required in Phnom Penh. It pays to carry a combination of both USD and the local currency, the riel. You’ll get slightly better deals using the riel for around town purchases though this may only take on significance if you spend a few weeks in country. Weekend trippers are not likely to transact often in the local currency. ATMs accepting foreign cards and dispensing USD are now found all throughout the city so it’s possible to minimise the amounts of cash you carry. International ATM charges are high. Local bank branches will levy a US$3 - US$4 local charge per transaction - sometimes more. Meanwhile, your host bank at home may levy additional charges as high as 5% making ATMs a very expensive service indeed. It makes sense to keep a few hundred US dollars spare in case there are bank or credit card problems. We’ve found ATMs very reliable if very expensive. It’s also a good idea to travel with more than one ATM card if you plan to make the ATM your main source of cash during your travels. Credit cards are widely accepted at international hotels and large shops catering to tourists. They are less widely accepted at smaller hotels, shops and restaurants. Many local hotels will levy a 3% charge on credit card transactions. Many locally run hotels do not accept American Express or Diners cards. International hotels usually accept all cards without surcharge. Internet access - usually free - is ubiquitous in Phnom Penh. Most standard and budget hotels offer free internet access as do cafes and restaurants. Most international roaming plans work in Cambodia so you should be able to keep your mobile phone on while in country. Good cheap local prepaid SIM card plans are also available for those wanting to make lots of cheap local calls. Grab a SIM card as soon as you arrive at the airport. International calls from Cambodia are expensive from hotels, mobiles and landlines.